Front row from left are Colin Jones - CCHS PE Instructor, Cannon County Schools Nurses RN Leslie Pelham, RN Joanie Blackburn, RN Emily Gilley, Cannon County Coordinated School Health Supervisor Bonnie Patterson. Back Row from left are Cannon County Director of Schools William F. Curtis, CCHS Principal Mike Jones, CCHS Health Sciences Instructor Linda Cook, Athletic Director & Biology Instructor Matt Cagle, CCHS School Resource Officer Jordan McGee, and CCHS Assistant Principal Kay Barker. Cannon County Schools recently became the latest school system to join Project ADAM Middle Tennessee. Project ADAM (Automated Defibrillators in Adam's Memory) aims to prevent sudden cardiac arrest in children and teens through education and life-saving programs. This hospital-based community outreach program is committed to making automated external defibrillators (AEDs) universally available to all children and adolescents. It also works toward eradicating sudden cardiac death in children through research, education, and prevention initiatives. Monroe Carell Jr. Children's Hospital at Vanderbilt has committed to creating an affiliate program for the Middle Tennessee area. This new program is in alignment with the overarching vision of Children's Hospital to serve as a community that is responsive and passionate about improving children's health in Davidson and surrounding counties. Leslie Pelham, a nurse with Cannon County Schools, said the system will be able to purchase AEDs for all seven county schools through a grant from Ascension - Saint Thomas Health. 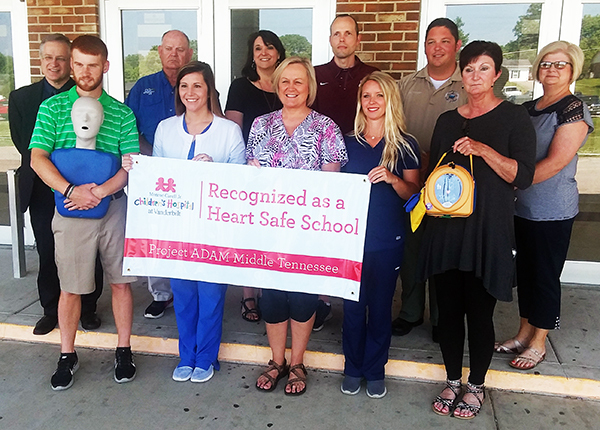 Project ADAM designates schools as Heart Safe once they have taken all necessary steps to safeguard students' health. • Conducting emergency response practice drills at least annually. Project ADAM began in 1999 after the death of Adam Lemel, a 17-year-old Whitefish Bay, Wisconsin high school student who collapsed and died while playing basketball. Adam suffered a Sudden Cardiac Arrest (SCA), in which ventricular fibrillation occurred. This is a condition in which the ventricles cannot pump blood into the body. Defibrillation, or an AED, could have saved his life. Adam's parents, Patty Lemel-Clanton and Joe Lemel, collaborated with Children's Hospital of Wisconsin's Herma Heart Center to create this program in Adam's memory. The program has expanded to 12 states. Over 100 lives have been saved through Project ADAM affiliate programs in which an appropriate and timely response was enacted following a sudden cardiac arrest. Learn how Project ADAM is part of hospitals across the nation by visiting the national website, www.projectadam.com.